Formerly an independent kingdom, Madagascar became a French colony in 1896 but regained independence in 1960. During 1992-93, free presidential and National Assembly elections were held ending 17 years of single-party rule. In 1997, in the second presidential race, Didier RATSIRAKA, the leader during the 1970s and 1980s, was returned to the presidency. The 2001 presidential election was contested between the followers of Didier RATSIRAKA and Marc RAVALOMANANA, nearly causing secession of half of the country. In April 2002, the High Constitutional Court announced RAVALOMANANA the winner. RAVALOMANANA achieved a second term following a landslide victory in the generally free and fair presidential elections of 2006. In early 2009, protests due to increasing restrictions on opposition press and activities resulted in RAVALOMANANA stepping down and the presidency was conferred to the mayor of Antananarivo, Andry RAJOELINA. Following negotiations in July and August of 2009, a power-sharing agreement with a 15-month transitional period was established. Elections are expected in the fall of 2010. 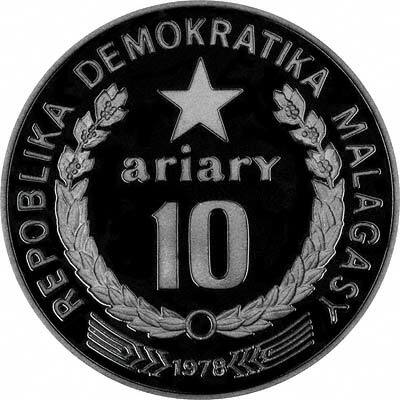 For silver and base metal coins of Madagascar, please look at our original Chard Coins website. We make an active market in almost all world coins, gold or otherwise, including Madagascan gold coins. If you have any of these coins to sell, please contact us, or post them to us for appraisal and offer.